Great Value! 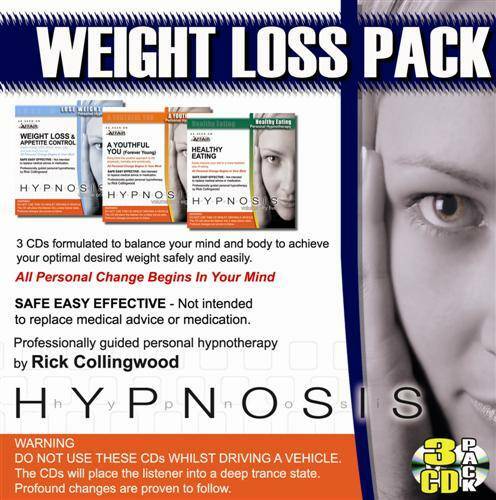 Contains THREE Weight Loss CDs for the price of TWO! Weight Loss & Appetite Control: (Platinum ARIA Title: Directly target all areas for successful and permanent weight loss. Healthy Eating: Control your eating patterns and the types of food that you choose to eat automatically and without hesitation. A Youthful You: Refine your body and its systems to feel youthful, energetic and physically superior to embrace becoming the perfect weight for you. Simply alternate the use of each of these CDs according what suits your needs and time restrictions for a Holistic Approach to weight loss. Each CD is designed to complement the other and give you the COMPLETE set of tools to achieve your goals on every level. Each CD in this program is a top selling title and is a proven means to enhance any weight loss goals you may have. Imagine being able to approach losing weight with complete control over your emotions, willpower and a solid alignment between your mind and your body to ensure a permanent and successful transformation. Well this CD pack is your answer!